It was SO cold in Seoul. I was there for work in February, and my face was frozen. Granted I was only wearing a trench coat, but that doesn’t really have anything to do with my face. My trench coat does not cover my face. 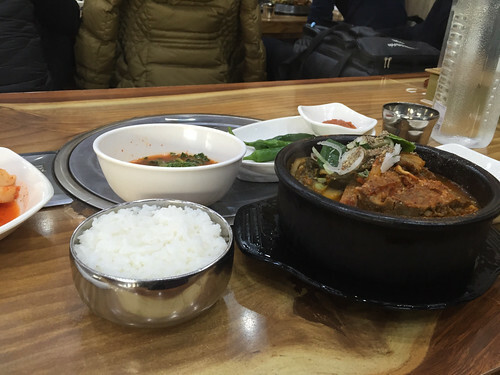 Anyways, because it was so COLD I wanted to eat some Pork Bone Soup. After checking out a fellow bloggers post of Seoul For Two Plz, I came across this restaurant called “Idaejo Bbyeodagui”. 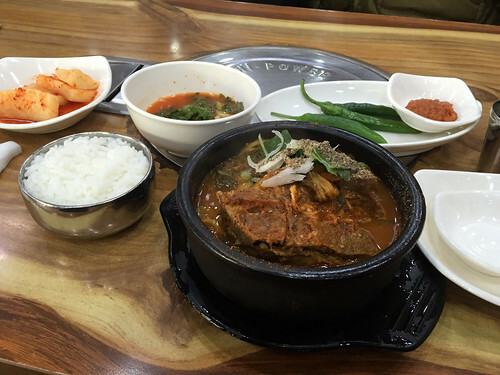 They only have three dishes I believe, Haejangguk (7000 won, Pork Bone Soup), Gamjatang (spicy pork bone soup with potatoes), and Deungppyeo Jjim(pork backbone braised). I had the Haejangguk because I came alone. I think to order the other dishes you have to at least have a party of two? I don’t know, I sat down and the waitress say “One?” and said yes and she said okay. 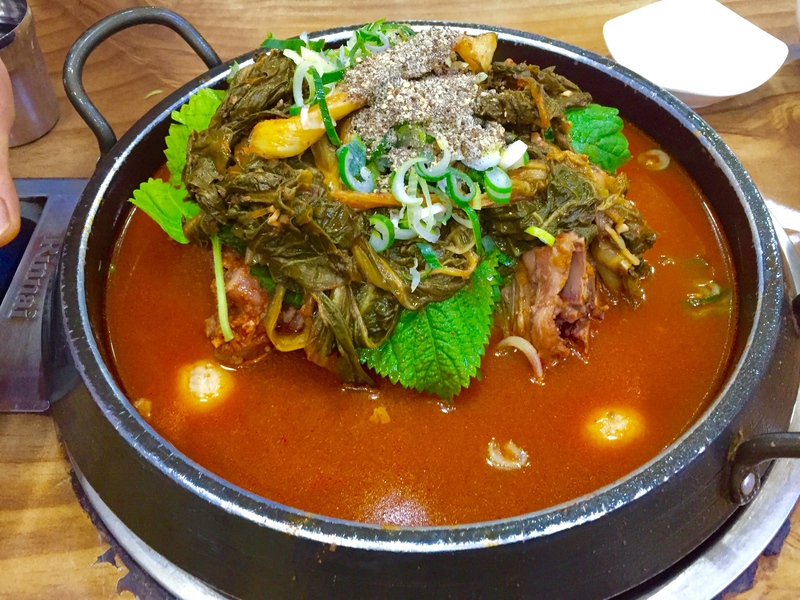 And in came a Haejangguk. It was damn delicious regardless. Usually pork bone soup there is not a lot of meat, but this restaurant had a lot of meat. I was satisfied. The soup base was flavorful and spicy, and when combine it with rice it’s just super awesome. Super recommend this restaurant, especially since it’s near Hongdae you can come by after a drinking session. Oh yeah it’s also opened 24-7. 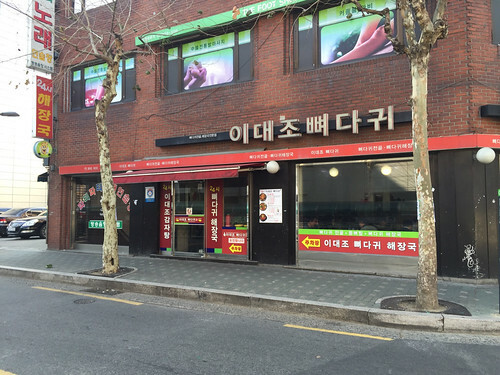 It’s a 2 min walk from exit 2 in Hongdae as well (pass starbucks), just look for this restaurant! Picture added on March 25, 2017. Tried the Gamjatang. It’s basically the same as the one I blogged about but bigger with potatoes. I prefer the first one! Went there tonight, it was soooooo yummy, thanks for the recommendation! Got the soup and the stew, the potatoes and the noodle in the stew were amazing. glad you liked it “wendi”. it was awesome and i am jealous of you! Korean soups are the best. 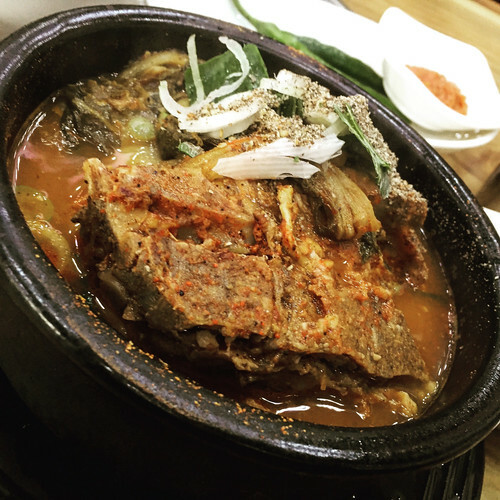 Nothing like when that hot stone bowl comes out of the kitchen–and your soup is so hot you can hear the simmering. Great post. I’m going to have to head to K-town for a fix! Totally agree with you!! Hot stone soup on a cold day? Sign me up.